Employee Incentives and Performance Reviews are resented by most people, and the evidence quoted in support is pseudoscience. You can't make a Fendi out of a sow's purse, or something like that. Dressing up data to look scientific is to be expected from those trying to prove that aliens have landed, the Mayan prophecies are real and the end of the world as foretold by Nostradamus, is about to happen. Talk about a guy who is hard to kill! But it disturbs me to see it used in major corporations in whose hands are entrusted the lives of thousands who work for them, and depend on their products. 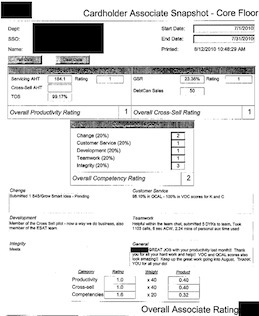 Have a look at this document, a real-live employee performance measurement document, or whatever slick acronym people who need a spanking call it. It was mistakenly sent to me by fax. It strikes me as an absurd attempt to make a completely irrational practice appear to have mathematical precision. You know the argument, "since you can't evaluate performance based on subjective measures, we need to find hard measures to be more objective." The first part of the word is right, object, but it should end in "ion able" not "ive." Names have been blacked out to protect the innocent and the guilty. Pseudo-science pollutes the thinking of companies and governments around the world. People can only work within the limits defined by the system they work in. Rewarding or punishing for what they cannot control is the opposite of science –a sad waste. Since employee's well being depends on a good score, people will pay more attention to what is being "scored," than on the job at hand. They will do what is needed to score, even to the point of scamming the system. I pity those who have to put up with this kind of thing from the people who hold power over them. I dislike management make-work. There is enough real work to be done, like Leading, Removing Barriers to being able to do a good job, Training, Clarifying the Vision. Unless you hire the kind of people who only want to please the teacher, those who spend their lives trying to figure out the right way to stand in line, as Mr. T said: "I Pity the Fool!" Only the loser keeps checking the scoreboard! The rest of us resent it.